You only have two free days and you do not know what to do in 48 hours in Deltebre? Do not worry! Just because you have limited vacation time does not mean you cannot see and do many things. Therefore, we have created a 48-hour travel itinerary with some of the greatest experiences you must live if you visit us. Enjoy a tasty meal, savour the local cuisine, connect with the local people… Anguila en suc (eel in sauce); arrossejat (rice with fish served separately); arròs, col i fesols (rice, cabbage and haricot beans); frog legs; mussels and oysters; duck from the Ebro Delta… There are so many options that you will not know what to choose. But do not worry because whichever option you choose it will be amazing! According to the season, remember to book a table before. The mouth of the river is one of the most impressive places in the Ebro Delta, so you cannot leave without having visited this place. The last sunbeams will paint a beautiful sky for our walk. We will go to the Zigurat viewpoint, where we will enjoy a magnificent panoramic view of the mouth of the river and the islands of Buda and Sant Antoni. This will be a time to fill yourself with positive energy. Oh! If it is summer, remember that from this time on you should take with you mosquito repellent! If you already knew this place, we have a plan B for you. 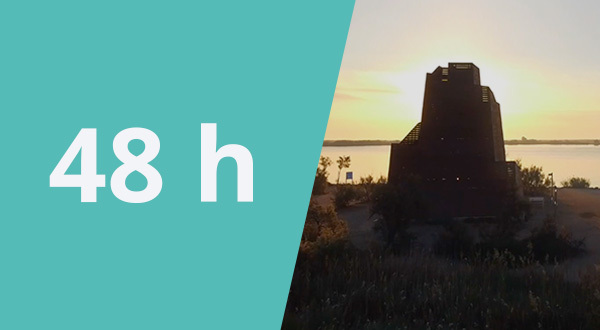 Take a stroll along the Ebro path, cross Lo Passador bridge and go to the Molí dels Mirons viewpoint, which is one of the best places to watch the setting sun, especially in winter.